Happy Black Friday! 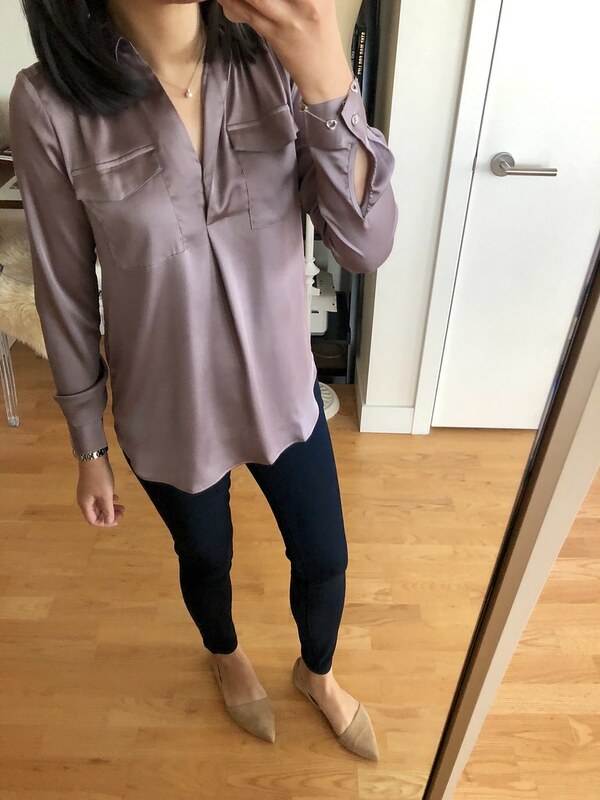 Did you catch my previous post sharing new LOFT reviews and a comprehensive list of Black Friday sales (including a few sales picks)? I have a feeling many of you are waiting for free shipping which usually accompanies the Cyber Monday promos. Meanwhile get 50% off your purchase at Ann Taylor. Use code BLACKFRIDAY. Sale ends 11/24 at 11PM ET. Valid in stores and online. Refer to my Ann Taylor reviews here. A few of the more popular items are selling out in various sizes. I love the above soft sweater in modern taupe and it’s also available in grey too. The cross over detail at the chest adds interest while providing modest coverage. Size XXS regular fits true to size and since it’s not available in petites I would say it fits like how size XSP would usually fit me. The sweater is a shorter length (size XXS regular is 22″ total length) making it petite friendly. It doesn’t contain any wool so it’s soft without being itchy. 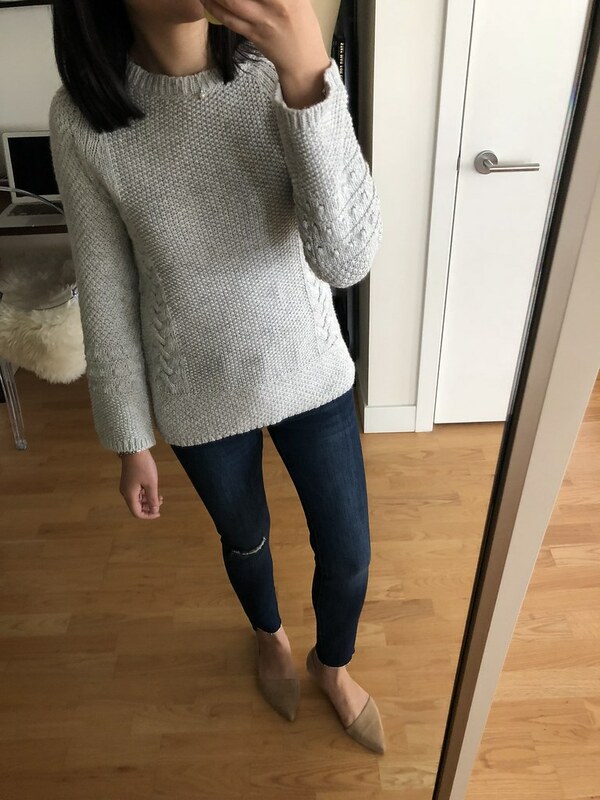 I wanted to love this textured grey sweater since the knitted detail is pretty. It’s another no-wool sweater but the sleeves of my usual size XSP was too short for my arms. It also was not as relaxed through the waist and hips as I would prefer. Size XSP is 23″ total length and 35″ along the bottom hem. This sweater is also available in red and winter white (I don’t know how I missed that color). I’ll have to try this sweater again in size XXS regular for the extra length. 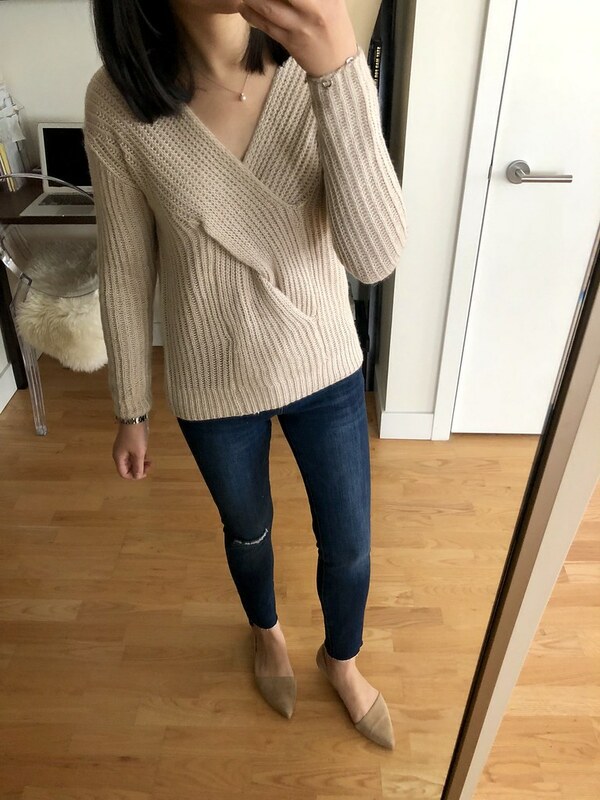 Update 11/24: I tried on size XS regular today (the winter white color goes by a different name but it’s the same sweater/style) in store and it fit me well. This new camp shirt is perfect for adding some holiday shine. I have been consistently going down a size in the camp shirts since they run one size bigger. This version/color does run a bit smaller than the polyester ones I own in whisper white (last seen here) and the leopard print (last seen here). I love these jeggings in both black (shown above) and the pure indigo wash (shown below). They have a comfortable stretch to them and I can’t wait to wear them out for a full day to see how they hold up. They run true to size and I took my usual size 25/0P. I love the narrow ankle opening and the petite inseam is on point. 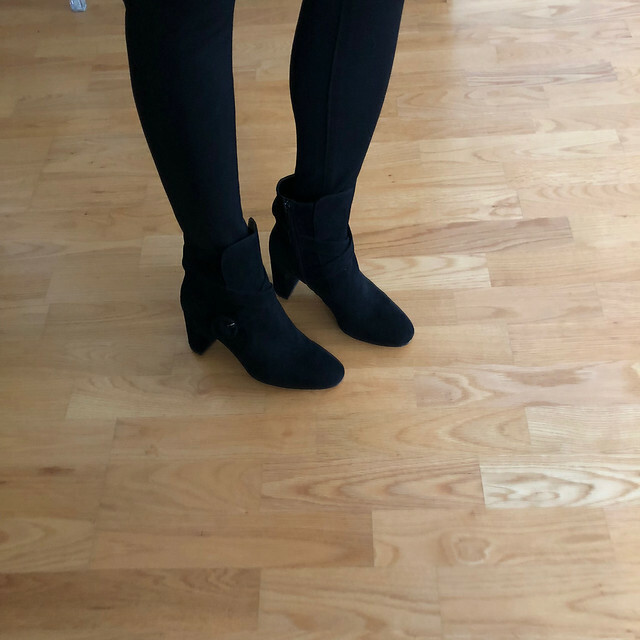 Update 11/27: I had the opportunity to wear both pairs jeggings for a full day each (one on Sunday and another today) and I’m happy to report that they hold up their shape well! I ordered and tried many jackets in trying to put together an outfit for a sponsored post. 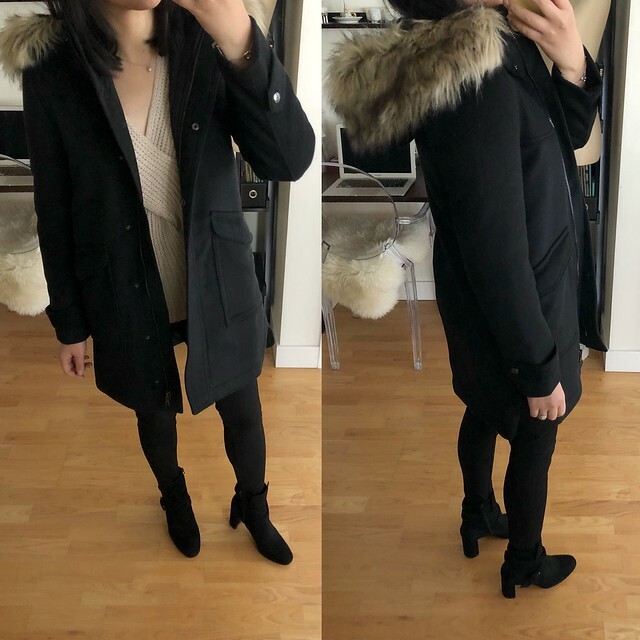 It came down to this black faux fur parka which is similar in style to my beloved J.Crew Chateau Parka (review here). This parka is also available in grey. The jacket has a quilted lining so it is warm enough for chilly weather (it was below 20 degrees Fahrenheit when I wore it out for a photo shoot with my husband). The faux fur trim on the hood is more generous and not removable. If you unbutton the faur fur it unfolds to nicely shield your face from the elements since it makes the hood even bigger thereby providing more coverage. I would say this jacket runs true to size with room to layer underneath but it’s not as generous in sizing as the J.Crew version. 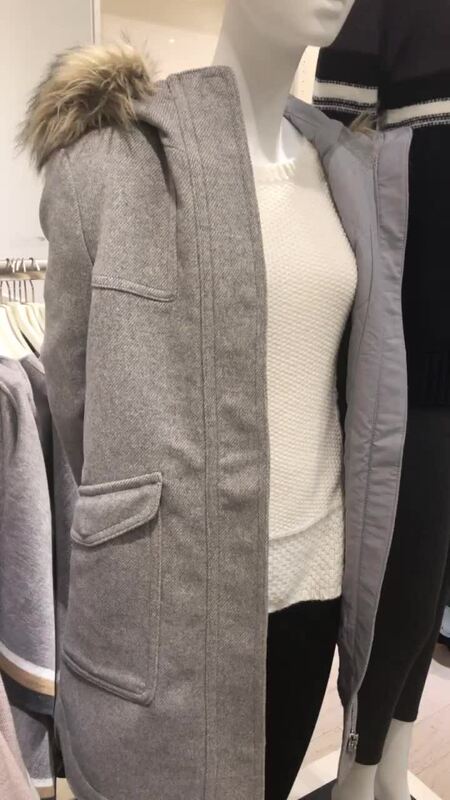 My friend Lilly also got this jacket in grey and she went up one size from her usual since she found that it runs narrow across the shoulders. 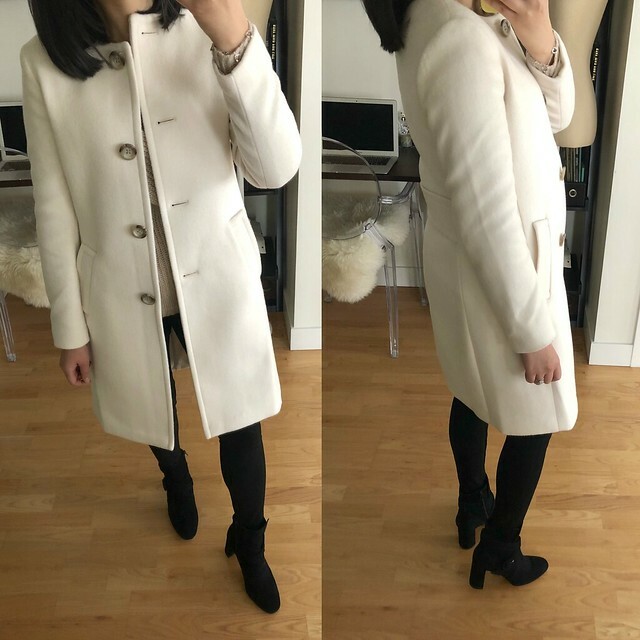 I really wanted to love this winter white coat after seeing it on all my favorite bloggers but I just didn’t love this one on me. I have the same fit issue with the J.Crew lady day coat where I don’t love the style on me despite it looking very chic on other bloggers. The spacing of the large buttons looks awkward since I have minimal curves so I didn’t like how it draped against my figure. The overall length is too long (it hit me mid knee cap). The shoulders felt slightly narrow and uncomfortable with this sweater underneath. Size XSP has 14″ shoulders, 35.5″ chest, 23″ sleeves and it’s 35.5″ total length. This mixed print scarf also makes for a cozy shawl as seen in the picture on the right (view the video clip here). I love the thicker material since it’s very effective in blocking out the wind. As a blogger I also found the various prints useful as a backdrop in some of my recent flatlays. Size XXS regular fits me well in these pajamas and I was happy that the pant inseam (28″) wasn’t too long since I’m 5′ 2.5″. The bottoms that came with the set I received had some loose threads that I had to cut off on the ribbon tie at the waist as seen here. 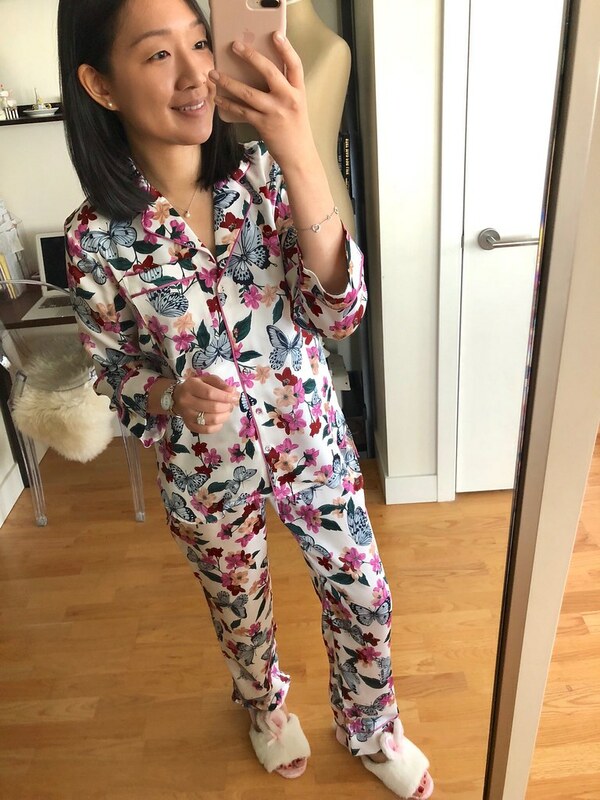 If you plan on gifting these pajamas I recommend double checking the set for any defects. I really wanted the darker floral print but my size sold out quickly. I’ll have to keep an eye out in case my size pops back if someone decides to return it. Update 11/29: I ordered the other color today when my size popped back and I hope it ships! These bow pumps are gorgeous and they run true to size. Unlike the other online reviewer the middle bow strap lays against the top of my feet so that there is no noticeable gap. They’ll be sure to get a lot of compliments. Update 11/29: I wore them today and my feet feel a little sore. They will require some breaking in but I got a few compliments from the ladies in my office. I love these booties and I wanted the brown color but I didn’t love the white stitching so I chose the all black color. They run true to size and have a 3″ heel which is a comfortable heel height for me. They’re very chic and well made. Update 11/25: I wore them out today and they are slighty snug across the tops of my feet but not in an uncomfortable way. Note that I usually wear these perfect knee highs with my boots and booties. They’re not too thin (they’re opaque versus sheer), well made and they’ve lasted me a long time. I love this cashmere colorblock ribbed turtleneck sweater which I reviewed here in size XS regular. I ordered size XSP to see if the long sleeves would be better but it didn’t drape as nicely as the missy size. It runs true to size but I prefer the missy sizing for a comfy oversized look through the body. It’s expensive even on sale so I’ll keep an eye out to see if it goes on clearance and I hope my size will still be there. I tried on this black snappy funnel neck coat and this red funnel neck coat (sorry for the lack of pictures). Update: My usual size XSP fits true to size in the black funnel neck coat with room to layer. I was wearing an thin top before which effected my opinion of how it fit. I was just about to return the black coat via ShopRunner but then I tried it on again over a sweater. 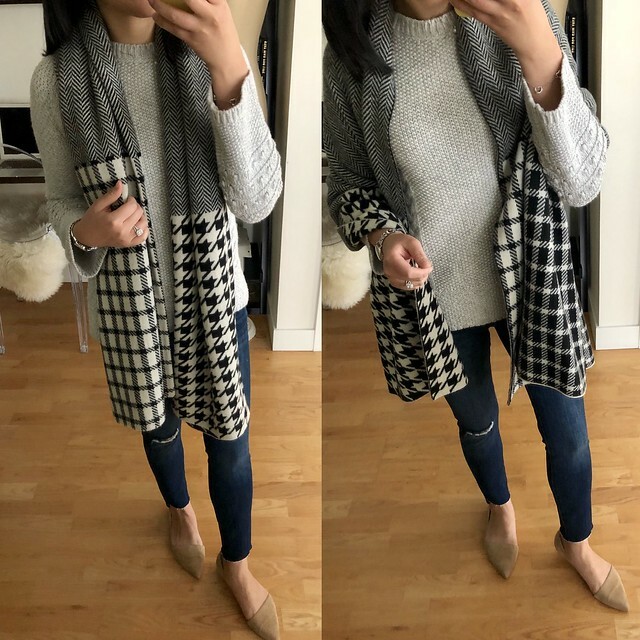 It hits just above my knees so it’s not as long and awkward looking compared to the jewel neck coat I reviewed at the top of this post. The measurements of the black coat in size XSP are: 14″ shoulders, 36″ chest, 37″ hips, 22.25″ sleeves and 34.5″ total length. Update 11/30: I love the red color so decided to exchange the red funnel neck coat from size XSP to size XXSP for a closer fit. Size XXSP fits like size XSP. It’s one of my gifted items since I have another upcoming holiday themed post with Ann Taylor. I tried this faux fur jacket which is well made but my usual size 0P ran small and narrow while the faux fur material was thicker so it was an awkward snug fit across the shoulders. The sleeves were also short hitting a little above my wrists. Perhaps I need to try size 2P or 00 regular but I don’t see myself reaching for this style coat much except around the holidays for a more glam look. This sequin balloon sleeve sweater is a thin material with a subtle shimmer (refer to the above video clip). I wish it came in petites because size XXS regular was too baggy on me so I had to return it. 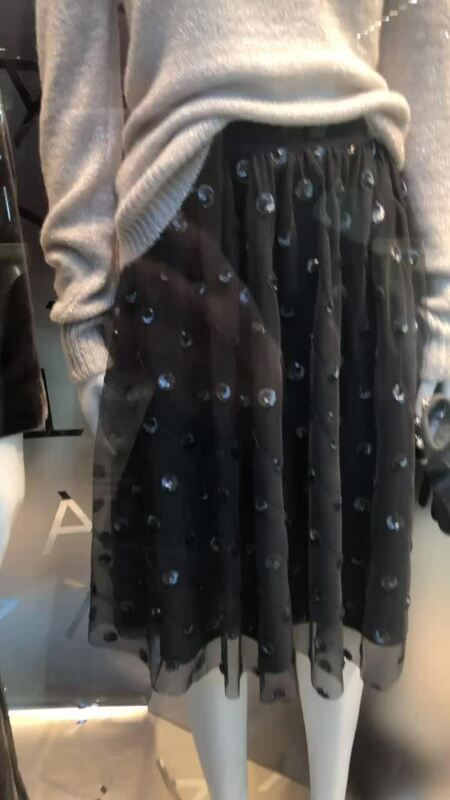 This sequin dot tulle skirt (refer to the above video clip) runs very big and it has a elastic waistband so I would suggest sizing down if you’re interested in trying it. If you usually take sizes 2P (and possibly size 4P) and under at Ann Taylor I believe you will be sized out of this skirt. You would have to alter the waist to make it fit as expected. I didn’t love it in person so I returned it asap via ShopRunner. Click here to see a close up of the sequin detail. The ombre coatigan runs larger so I would suggest sizing down if you want to try it. I didn’t love the material or the color in person. The sash when belted looked awkward on my figure since I have minimal curves and no waist to actually define. These modern lace hem all day skinny jeans run one size bigger since they have a lot of stretch. The lace hem is sewn on making the bottom hem thicker/stiffer which makes it difficult to take them off if you don’t have smaller/trim ankles. The overall length was awkward on me and the lace hem wasn’t quite what I expected so I returned them. I ordered a few of the new jewelry pieces to try but I was disappointed that these pearlized pave drop earrings were very oversized making them overwhelming on my ear lobes. 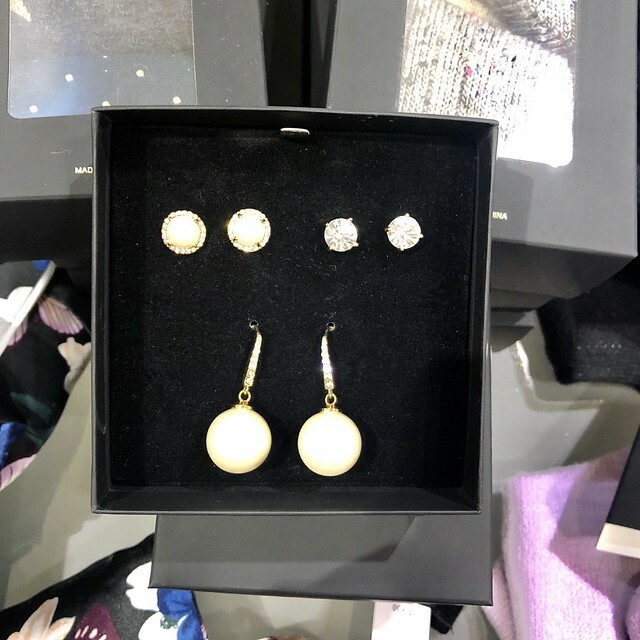 This gift boxed earring set (refer to the above picture) looked promising but the pearl drop earrings were too large and look like your wearing mini ornaments. The only pair I liked from the set were the middle pearl earrings with the surrounding pave stones which are classy and a perfect size for daily wear. LOFT has a similar pair of pearlized pave stud earrings.